We had found the house on one of those vacation rental sites that predated VRBO and Airbnb. A little less slick, a little more like roulette. It was an old medieval home, tucked up in the hills of Sintra, Portugal, the centuries-old summer roost of Portuguese kings escaping the sweltering Lisbon heat. Our original notion in renting the house had been to create a DIY artist colony. But one by one, artist friends dropped out over financial or family or job pressures. By the time we arrived, although art was somewhere in the back of my mind, I had a new plan: I was preoccupied with a scholarly essay I had to write about Ovid’s influence on Edmund Spenser. I was excited about the essay—for the first time, another professor had asked me to contribute to a collection of essays she was editing. But the deadline had just passed, and I was frantic to finish it. I was focused. I was committed to figuring out what I wanted to say. I would add some flash of brilliance to a timeworn subject, and modestly too! Try as I might, I couldn’t break through my writer’s block. I took long walks on the cobblestone streets and hiked up the paths of the hills above the town. With its towering eucalyptus trees, the forest—which one entered through a giant stone turnstile, to keep out livestock and wild boars—felt medieval, as if I might run across one of Spenser’s knights or perhaps an orc on one of my strolls. A ruined 9th-century Moorish castle sat on its haunches at the top of the hill, thinking lonely thoughts. We had been informed that the antiques dealer who owned the home had put away the breakables so that we wouldn’t be nervous about navigating the house’s narrow hallways and small rooms. It turned out that by “breakables” he meant, exclusively, crystal. He left all the porcelain figurines, the glass baubles, the bronze keys, the delicately painted plates, the plush chairs, the squat elegant side tables, the wooden dolls upon dolls upon dolls, scattered over almost every inch of available wall, floor, and table surface area. The house was a wonderland of antiques. You could barely move in it. The rooms were so tiny and weird that the first time we went through the house, counting all the beds where our family and friends would sleep, we realized that we must have missed an entire room, because we were one bed short. And indeed there it was, at the top of the tiny narrow staircase to the attic-like third floor, behind a mirror that looked like a wall but was actually a door. Beyond that door was a small double bed facing another mirror, fronted by a lamp fashioned from a wooden doll. When you turned her on, she seemed to be in flames. During the month we stayed there, no one ever felt like sleeping in that room. At night I wandered through the house, stopping at each doll, each porcelain animal, each framed map, hoping for inspiration. Everywhere, instead of hearing Spenser and Ovid conversing about influence, I heard each little object hunching and whispering to itself. The history of the house, the town, the forest was so palpable and ever-present that I couldn’t think my own thoughts. I set myself another deadline. By the end of the week, if I hadn’t broken through on the essay, I would give up. Friday came. We had a lovely dinner at one of the hundred amazing seafood restaurants. There were tiny grilled squid jeweled with lemon juice. A chocolate mousse apparently made of air. At midnight that night I got up and wandered around the house. The dolls were talking. I sat down in front of one of them and started writing what I heard. I did that for the rest of the month, going from doll to doll, map to map, listening and translating. To this day I haven’t finished the Spenser essay. We often think of writing as going inside ourselves for inspiration, or as expressing our innermost thoughts and feelings. It’s never been like that for me. At its root, I find my poetry to be an art of listening. An art of returning to what is lost in and by the world, and prying it out from silence. An art of finding out not what I want to say, but what someone or something else in the world must say, and maybe is already saying, in language I can’t yet hear. David B. Goldstein’s second poetry collection, Lost Originals, is just out from BookThug. It features silent dolls and other antiques from Sintra, Portugal, as well as a host of other speaking objects. 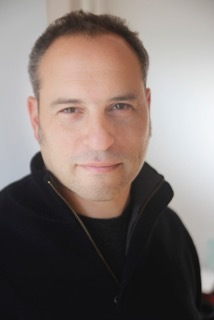 Goldstein is also a literary critic, whose book Eating and Ethics in Shakespeare's England (Cambridge, 2013) won the Shakespeare’s Globe Book Award. He lives with his family in Toronto, where he is Associate Professor of English and Creative Writing at York University.